Replies: 17 (Who? ), Viewed: 931 times. #1 21st Mar 2019 at 5:06 PM Last edited by Rosebine : 22nd Mar 2019 at 1:48 AM. Seemed to have worked, and I am the first one surprised. It is now recolorable...but blue. I edited the mesh, combine the crayons(surface_clean) with the surface group. Fixed shape, gmnd...I even created my own MMAT from scratch. I did something wrong obviously, as in game, well it acts as if the txmt was faulty or something. In SimPE though, the table looks perfect when previewing the mesh. First, your new MMAT should probably be in its own package file and placed in the game folders, not the downloads folder. Second, your TXMT probably has a missing or misspelled reference to the TXTR file. If that doesn't work, I'm happy to have a look at it . #3 22nd Mar 2019 at 1:06 AM Last edited by Rosebine : 22nd Mar 2019 at 1:47 AM. The MMAT is all alone and in my game files already. Thank you very much. I checked and re-checked, but saw nothing...You're surely better at finding what I didn't. The one named activitytable is the mmat, the other is..the other. @Rosebine: I think your MMAT needs to have an Instance other than zero. Also, the name of an MMAT needs to be the name of the TXMT it links to. Your MMAT is calling a TXMT named "surface" , but the TXMT in the other file is named "activitytable _surface_clean". The line "name (dtString)" in the MMAT should be the exact name of your TXMT. You guys are awesome. Thank you, I am so happy...you should have seen my smile. The MMAT intances DO conflict with others. You should always hash the name of your MMAT/cres to get a unique instance. When I said no instance change, I thought they were talking about something else. The new GUID/hash generator thing was already done, as i read that while browsing to try to learn how to do this...before come crying in here. The family number needs this as well, but the instance of the resource also needs to be unique. #10 22nd Mar 2019 at 2:16 PM Last edited by Rosebine : 22nd Mar 2019 at 2:36 PM. Ok. So which other resource needs a new instance, other than family? And how do you give a new instance..is it as clicking on hash generator? I am getting confused. lol. I fixed integrity, it gave a new instance, then I renamed to what it was, removing the prefix it added. Is that ok? IIRC, you can use the 24-bit or 32-bit options in the Hash Generator to get a (hopefully) unique instance for the MMAT. But where would you copy it? I saw this and was wondering. So i choose fix integrity instead. You can change the TGI values of a resource, such as an MMAT, in the Resource tab. So you would highlight the "CRC 24" or "CRC 32" hash value, copy it to the clipboard, click on the Resource tab, paste it into the Instance field, then click in any other field to Commit. It does like fix integrity without changing the name? because this is what I have now. It doesn't change anything but the value you replace, so you have more fine control than Fix Integrity gives you . I now have both states (clean and dirty) as recolors. I read a few places while looking for infos, that the activity table never uses its dirty state in game. I have not play tested long enough to actually get it *dirty* or to have a sim *clean up*, but now that I have this CEP, all my recolors(my cloned one) are doubled, as in...both my new dirty and new clean textures can be selected. The same goes for the original table, which I have not recolor yet. The change states are controlled by BHAVs, so you can examine game objects that have clean/dirty or lit/unlit states to see how they are set up. It is highly likely that the BHAVs are not included in the packages, so you probably need to follow links in the OBJFs to find the actual BHAVs needed, then import them into your package and edit them to suit your purpose. One mechanism I know that facilitates dirty/clean states is in the MMAT. The line "materialStateFlags" will use one of two different numbers, something like 0x00000005 or 0x00000007. One will be for clean state, and the other for dirty. Those numbers will point to lines in an STR# text file. Again, you will have to examine known objects with state changes to figure out which STR# you need to import to set that up. But...I like this feature And I will edit it back to what I had, which was a mistake, but a cool one. See, I've been thinking...it happens. Objects that have a dirty state, that actually get dirty must be cleaned by sims. Sims therefore, have an animation for this. Bath tub, they get on their knees and scrub. Like the pet bed. Sink, stove, kitchen counter, etc. 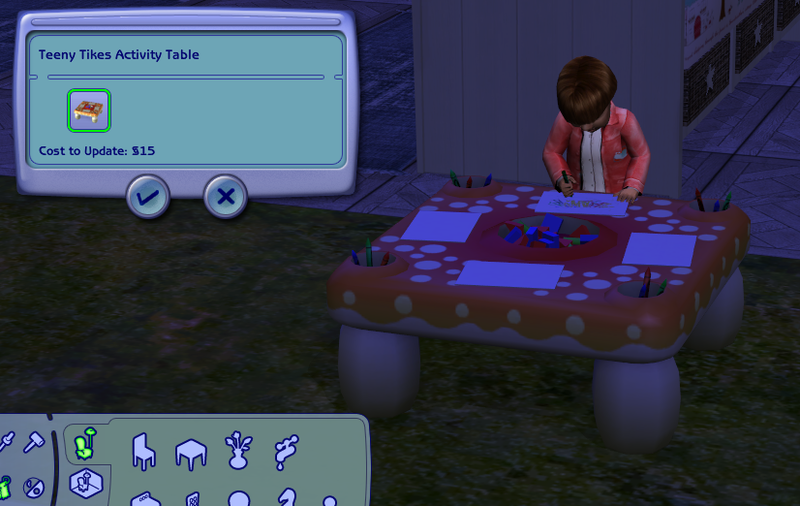 The activity table though, only has a *put away* anim. (not its proper name of course) A bit like the chess table, where the sim will just toss chess pieces out of the way. 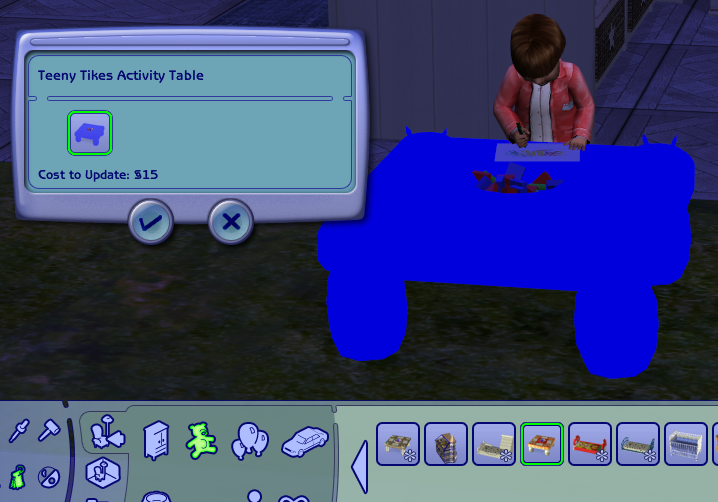 When a sim cleans up the activity table, they basically just toss the blocks back into the block pit, and take the drawing paper(s) that have been used(finished or not) out of the way. The only clean anim inside activity table is probably just a sweep up, standing up anim, like we see in game. I cannot import it into Ms3D to check though. If it was actually getting dirty, then maybe the proper anim would be called, but i doubt there is even suppose to have a get dirty state. Also, when would it get called? As soon as one of the four drawing spaces have something on it, finished or not, the Clean up interaction appears. I doubt this table would get *dirty* by just one little drawing event! Objects that get dirty usually do after a said number of uses. That table gets to be cleaned after only one. It would make no sense, to call the dirty texture then. So! I don't think that this object was made to get clean/dirty states, but the textures and references are still in. I have not find a activityTable global either...but saw a hotspring - find next seat, within the object. Makes you wonder. Since I do not know enough to rebuild the whole thing just so it can use the dirty texture when it would actually get dirty after said amount of uses, I will just leave it be and enjoy some dirty states recolors. Imagine that...having like 2 recoloring subsets in one.